The best selling hockey book in the Canadian maritime region this year probably will be East Coast NHLers: The stories of the lives and careers of players from the Maritimes and Newfoundland . 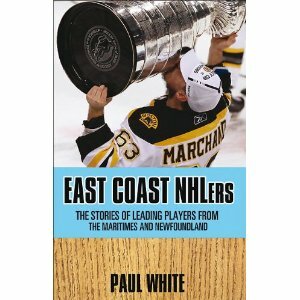 Veteran hockey author Paul White looks at the career and lives of hockey players from Canada's maritime provinces and Newfoundland. Highlighted by Sidney Crosby, Al MacInnis, and Brad Richards, there might not be a lot of Atlantic Canadians in the NHL but their journeys are all fascinating. Modern day fans will appreciate White's look at Crosby's rise from Coal Harbour, Nova Scotia to hockey superstardom, or the day Richards brought the Stanley Cup home to Prince Edward Island, or when Detroit's Dan Cleary and Boston's Brad Marchand and Michael Ryder brought the trophy home to Newfoundland. Every bit as interesting is White's look at some players from the past. He looks back at Nova Scotia's Al MacInnis and his feared slap shot. He looks back at Darryl Sittler and Lanny McDonald's old Maple Leafs running mate Errol Thompson, and Steve Yzerman's old winger Gerrard Gallant, both from Summerside, PEI. How many people knew Willie O'Ree, who broke the NHL's colour barrier, was from Fredericton, New Brunswick? White also looks back at Nova Scotian goalie Al MacNeil, tough guy Forbes Kennedy, sniper Danny Grant and old time Hockey Hall of Famer Gordie Drillon, all from New Brunswick. White also offers a special look at the game in Newfoundland in the chapter "Hockey on the Rock." He pays special attention to Newfie hockey legend Alex Faulkner and lesser-knowns like Keith Brown, Doug Grant, Joe Lundrigan, Tony White and Bob Gladney before moving forward to more recent times. Darren Langdon, Teddy Purcell and world juniors hockey legend John Slaney get brief profiles. Obviously this will be very popular under the Christmas trees of east coast hockey fans. You should be able to get the book under the sticker price of $17, making this 160 page book very reasonably priced. Don't expect the profiles to dig too deep, but it is an enjoyable and quick read.